Lots of romantic treasures to find for Valentine's Day. They'll be hidden all over the sim! 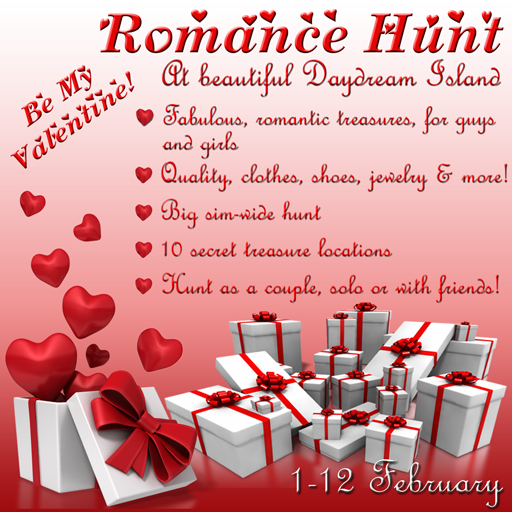 CLICK the Valentines Day Hunt Sign at the arrival point to get your first HUNT CLUE. You must wear your Daydreamer group tag to participate. (If you're not a member of the group you can join by clicking the Hunt Sign). The treasures are at different locations ALL over the sim and could be hidden in ANYTHING! Maybe in a vase, a chair or even a rock. Each clue is a RIDDLE. Use these to work out (1) WHERE to look and (2) WHAT to look for. When you find whatever matches the clue, click the object and the treasure will be delivered to your inventory. At the same time you'll be given your next CLUE. You get a message to congratulate you when you have found the last item of treasure. Feel free to share this blog post with your friends. Happy hunting one and all! There are 100's of balloons floating across Daydream Island today to mark the dawn of the new year. It's so pretty! May your 2013 be filled with happiness, love and peace. Ooops! New SL Art Site has a new URL! Images of 2D and 3D art from Second Life (SL). I've even included a few of my own. News, articles and information on Second Life art and artists. There's a Blog too so feel free to use the RSS Feed (top right of the page) to automatically get the latest posts. I hope you enjoy SL Art Exposed! Daydream Island in the news! You’re Among Friends . . .
As often as I can, I seek out Australians and their friends at work or play in Second Life. I’ve had occassion to drop in to Daydream Island from time to time and it came to my notice the sim-owner was an Aussie, a most charming and welcoming lady from my home State by name of Carmsie Melodie. As we sat to begin the interview, the arrival of many friends or group members gave me the sense of a very communal atmosphere. Not a few but some six or so group members arrived, all willing to provide input. Thus the scene was set, it seemed like a family. As the interview progressed it became evident they were not all Aussies either, they came from all parts of the globe. So I guess you could imagine the traffic when everyone’s in chat and all enthusiastically providing their contribution to the interview - I’m so glad I could swipe and paste text, voice would have been unmanageable! One by one, the group assembled, took a seat around in their favourite chat corner by the swimming pool. Firstly, Carmsie, then John Wolf, Elvira Mistwood, Ole Andersen, ZAney D’Argent, Alvir and few others I missed. After greetings and small talk was exchanged we got down to talking about Daydream Island and the group they call The Daydreamers. Whelan: Now Carmsie, about the structure here ... I’m guessing your sim is virtually group managed, would that be correct? Elvira: Also no biting around or she defangs us vampy creatures! Whelan: OK and by the fact you’ve gathered your group, I’m thinking its total involvement with all? Carmsie: When I am not here, people manage the sim on my behalf, yes. - but not in the way you may think - we have no official managers - people just care about here. Elvira: We take care around and report to Carmsie, we love and respect our family. Carmsie: Yes, people here make close friendships. we seem to have the difficult SL balance right socially. Whelan: And has it been a gradual group formation or did it commence in this fashion? and how long ago was that? Carmsie: When I started, the group was three people. No idea I think maybe 18 months or two years Daydream has been open, but as people arrived - ‘discovered’ daydream - many stayed. I think one of the key things is we encourage local chat - we can spend hours here chatting. On many sims, everyone is in IM. Whelan: I can understand that. And from the little I’ve seen, there’s nothing in the way of revenue raising, is that correct? Carmsie: Well no, but I have a donations thingy and people give what they can when they can, and some nothing at all. There is no obligation, I have a Marketplace store called Pixel Bits that I use to offset sim costs. Whelan: OK and on that basis it stands self sufficient? Carmsie: That is my dream Whelan - haha - sometimes - not always. This is like my giant playground - and I love that others play here too! We have fun here. I have created a romance sim (with some discreet naughty places) but I have no SL relationships ever - I am an enabler for others. 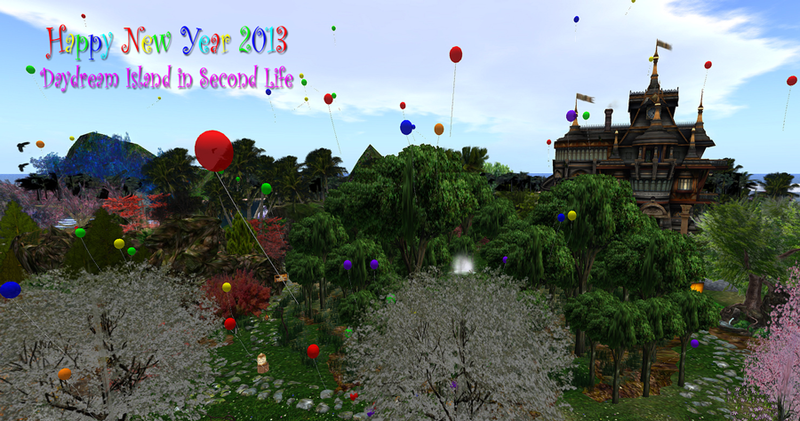 When I set it up my intention was for me to have fun and - well - like a big gift for SL people as well - that was my goal. Alvir: I consider the people I’ve met here to be my SL family - and we do play hard. I personally dont come to this sim for the ‘other (naughty) places’ - purely to catch up with the gang on the deck here - and I come here to get my aussie fix! Carmsie: Whelan - we are a very close community. Elvira: We love each of us. Whelan: Any plans for change in the wind, or everyone happy with current setup? Ole: It is a place you always meet someone you know from before. Alvir: Communuity? No Carmsie! Family! Elvira: Just they (noobs) scare me off when they are so many. Alvir: on my time zone, I see a lot of Spanish people. Carmsie: They (noobs) throw their own random parties here - I like that a lot. Many Aussies here too, but lots from all over the globe. Ole: With people from all over the world, it differs throughout the day who is here. Carmsie: it is hard to explain our management here Whelan - because we really dont have any at all - except me! Alvir: Carmsie is the boss - we’re all the ‘unpaid employees’ - We do it to protect our home! Carmsie: If someone is appalling, I get IMs and note card chat logs sent to me. then i evaluate and I ban them if necessary, but the ban list here is v short for the time I have been open - It just ‘works’. Ole: I think all the regulars here keep an eye on things when Carmsie is not here. Carmsie: But we have over 1300 in the group, oh another thing, here we have the Truthball, it's very popular and helps people meet. Carmsie: haha ... more like the soul-search ball with some challenging questions ranging from naughty to nice. Alvir: Well it makes for an intresting evening ..
Elvira: Many of us had friends and fell in love here. Alvir: A few weddings yes! Carmsie: Whelan, before you go, there is one special place on the sim I would like you to see, it is where we remember Daydreamers who have passed away in RL. Whelan: Some special meaning for you Alvir? Carmsie: we had a regular here, Megan - everyone loved her; she was sick; and passed away. Elvira: but she is living with us. I think of her as ‘went on holiday’ but still sad. Carmsie: People all wrote stories about their time with Meg and we made a book with pictures - we had it printed and sent it to her rl son in USA. We also sent it with US$400 raised here for his college fund. The book is very special. Daydreamers donated - was amazing - beautiful! That is what it’s like here - agreed guys? Whelan: That’s nice folks, a story of genuine feeling. Carmsie: We really care about each other and help, if we can. Alvir: One hurts Whelan, we all hurt. Ole: Yes, I joined SL after Megan passed away, but have been to the memorial place and feel she is someone I knew. Carmsie: I see many possibilities in SL in terms of ‘community’, this is one way we can achieve it. And I am allergic to drama, so, here’s a nice place to be! I then followed Carmsie and a couple of the group to a quiet hilltop area where the Daydreamers had built their memorial. Memorial for those we have loved and lost. Carmsie:We have lost three since Daydream has been open. Alvir whispers: Who were the other two Carmsie? Carmsie: One was a girl who was duped by an SL guy and took her own life, the other is the mom of one of our regulars - she was in here too! Alvir: Are the other two women recent Carmsie? Carmsie: The first was Isobel, the next was Meg and the most recent was Tessa - Tessa took her own life in RL. And it's not just me - all Daydreamers contributed to and visit this place. Well, people die in RL, it’s sad but a fact of life - but we make sure we remember them! 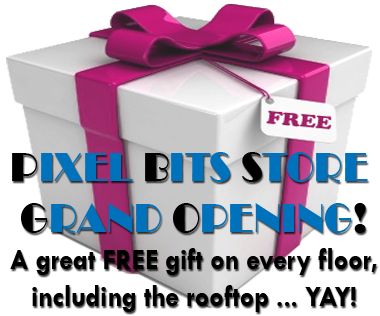 PIXEL BITS GRAND OPENING! FREE GIFTS! 100% of the sales from Pixel Bits is used to support Daydream island. All welcome, so feel free to invite friends! A marriage made in heaven! Malcolm and Angela were married on Daydream Island today. It was a truly beautiful ceremony. The celebrant's words were very touching and honest but, what really got all the guests sniffling, were the loving vows shared between the bride and the groom. It was a wonderful day. Congrats to Malcolm and Angela from all of us! Dance pole princesses - oh yeah! Elvira and Alvi drew a crowd this week as they slid, twisted, twirled, gyrated and flipped on the dance pole at Daydream Island. Wooohooo! Our Party - Tons of fun and great music! 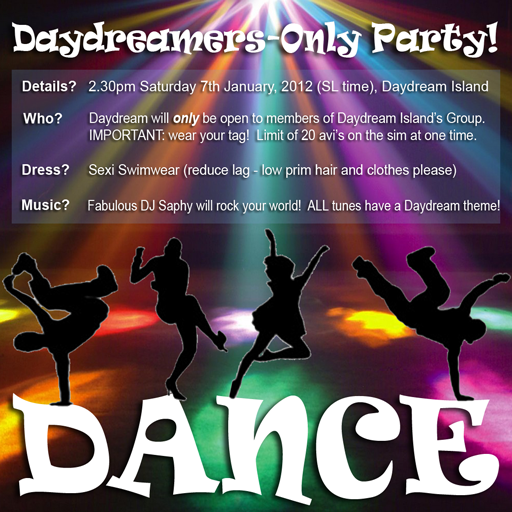 Everyone had a great time at Daydream Island's Group-Only party. The fabulous Angela Saphed put together an amazing play list of daydream-themed songs. The "weeee" gesture that makes people slide across the ground was used by many. This was great for me because it means I don't have to clean the dance floor now. YAYYY! Thanks to all who came along and made it such a fun event! The big dance sign at Daydream Island's hangout contains a note card with more info. There's a love bug at Daydream Island and it seems it is contagious! Firstly, several Daydreamers and friends were invited to Corporal Clock and Cattitude721's wedding at the lovely 'Chapel of Dreams' on Cerveza Island. There was a bit of a stalled start - the bride's pose ball was on strike and the Minister was in some kind of pixelated coma. But Angela Saphed stepped in to save the day, taking on the role of celebrant. It turned out to be a truly wonderful occassion! The picture above shows the newly weds having a longgggg smooch after they exchanged loving vows and were pronounced man and wife. YAYYY! After the wedding several of the guests returned to Daydream Island to watch the new Mr and Mrs Clock take their first dance. Wellll ... they tried to dance but lag prevented that, so the happy couple zipped off to the privacy their own home. 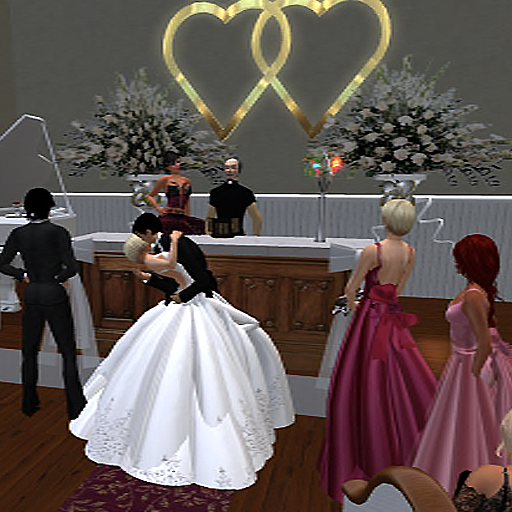 The guests that remained chatted and waltzed. Then - out of the blue - Derek Alexander asked Jessica Diavolo to marry him. Her answer was YES, so now we have even more to celebrate! 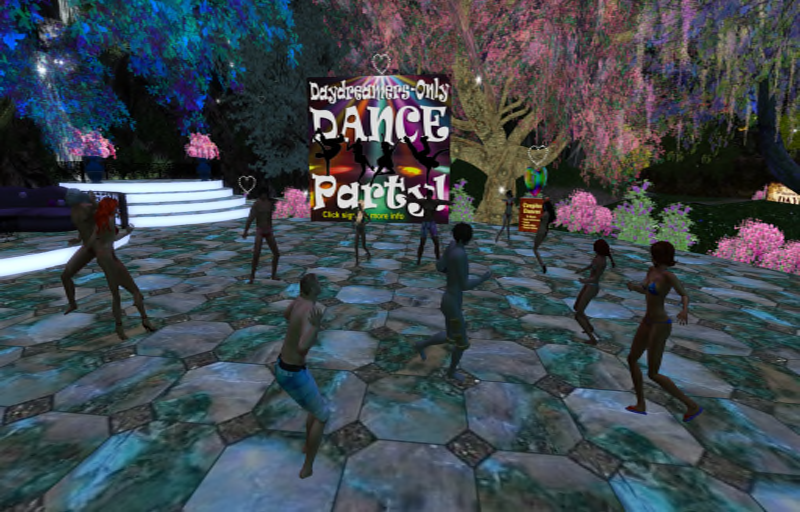 This Blog is for anyone who's interested in Second Life, particularly members of the Daydream Island Group. It's a place for SL news, fun stories, fashion, great locations, designers and lots of other cool stuff. Feel free to get involved by sharing us on Facebook, Google+, Twitter, connecting via our RSS Feed or by adding comments! Like to Blog for this site? Card to Carmsie in world.